[ads1] Bellator MMA 99 will mark the second fight card of the promotion’s ninth season and is headlined with a light heavyweight match-up between former Bellator 205 pound champ Christian M’Pumbu (18-5-1) and UFC veteran Vladimir “The Janitor” Matyushenko (26-7), in what will be his Bellator debut. 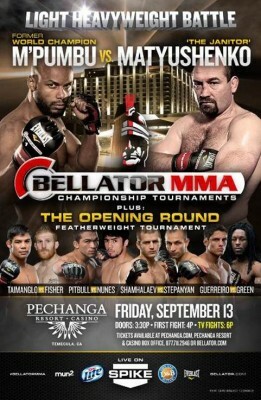 Bellator MMA 99 will take place Friday, Sept. 13, at the Pechanga Resort & Casino in Temecula, Calif., and will broadcast LIVE on Spike TV and in Spanish language on mun2 starting at 9 p.m. ET / 6 p.m. PT. Preliminary card action will stream LIVE and FREE on Spike.com. As always, ProMMAnow.com (www.prommanow.com) will provide LIVE results and play-by-play commentary throughout the fights. M’Pumbu comes into the bout on a two-fight skid. After winning Bellator’s season four light heavyweight tournament and title in 2011 with three straight knockout victories, M’Pumbu dropped a unanimous decision to Travis Wiuff in a non-title bout, then sat on the shelf for a year-and-a-half before losing his belt via unanimous decision to Attila Vegh at Bellator 91 in February of this year. Appropriately, Matyshenko is also on a two-fight skid. “The Janitor” made his return for his second stint in the UFC in 2009 and racked up a 4-3 record before dropping a TKO loss to Alexander Gustafsson in Dec. 2011 — then sat on the shelf for over a year before being submitted by Ryan Bader at UFC on Fox 6 in January of this year. So, considering M’Pumbu’s recent history, he and Matyushenko are coming into this fight under very similar circumstances. In addition to the light heavyweight headliner, Bellator MMA 99 will feature the opening round of the promotion’s season nine featherweight tournament with Patricio Pitbull taking on WEC and UFC vet Diego Nunes, and Shahbulat Shamhalaev taking on Russian countryman Akop Stepanyan. Rounding out the featherweight tournament quarterfinals and Bellator MMA 99’s main card will be Brazilian submission ace Fabricio Guerreiro taking on Bellator newcomer Des “The Predator” Green, and “The Juggernaut” Joe Taimanglo taking on England’s Andrew Fisher. 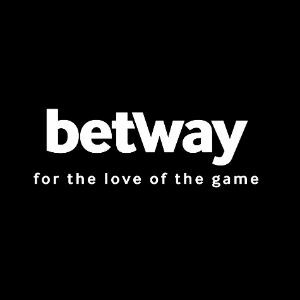 Stay close to ProMMAnow.com (www.prommanow.com) as the preliminary card match-ups for Bellator MMA 99 will be announced in the coming days.